New Moment, New Energy is about healing past imbalances, living in the empowered now and moving forward to create your best future self! ​ Love is the Oneness in our hearts that bridges the space between you and me and all of us and creates an expansive, inspired bond. It is the alignment of our souls on a dimension of Higher Consciousness. It is a pure, uplifting, incredible, often indescribable emotion. Anyone who has experienced the newness of being in love in a romantic way (and I would think that is most adults) knows what a true “rush” that can be — that exultant surge of emotion, that sensation of total attention and fascination with ones beloved. Love is that magnificent feeling that uplifts us, encourages us to be the best and most compassionate person we can be. Love on a deep level is placing the well being of another on the highest priority list, often before ones own well-being, illustrated perfectly by that profound and protective love of ones child. Love catches us by surprise at times… Nothing could have prepared me me the most heart-awakening feelings that I experience as a grandparent for my grandchildren – a whole different version of family love that is remarkably powerful. Do not forget to love yourself — be nurturing and kind to YOU. Allow love to infuse your life on the highest level – be open and receptive always. Be in the space of appreciation, as human Love is such a glorious blessing. And of course there is a whole other facet of love – the spiritual kind – the connection we have to God/Source/the Divine/Universe. Whatever beliefs you espouse, cultivate this spectacular connection, and trust that spirit and the Universe are always working for your Highest Good. 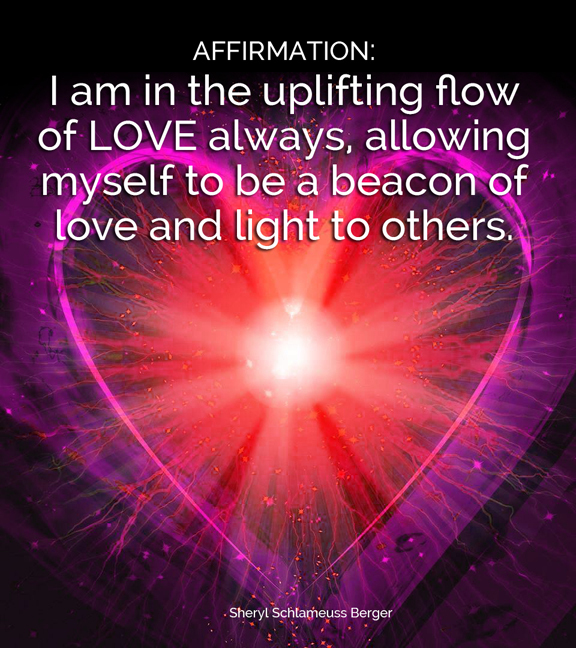 I am in the uplifting flow of LOVE always, allowing myself to be a beacon of love and light to others. I am in profound appreciation for all the close, supportive relationships in my life. 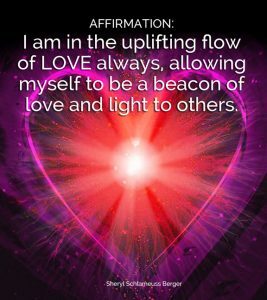 My compassionate self radiates with love to all those around me. Free Audio download – Relax and Release: Guided Imagery Affirmations for Serenity and Balance – enter your name for instant access!